When a patient presents with significant trauma, C-spine injury or a small mouth opening, you’ll want a familiar tool that works just as well in those difficult airways as it does in a routine intubation. Designed by emergency physicians, for emergency physicians. 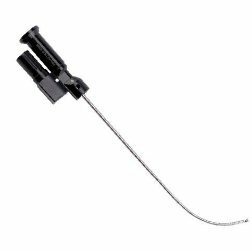 The Clarus Levitan combines several difficult intubation devices into one; malleable stylet, fiberoptic scope and oxygen insufflation. Use it to place your ET tube, LMA, tracheostomy tube, and more. Features high resolution eyepiece for conclusive placements. Malleable stylet gives superiorlaryngeal access. Atraumatic tip protects sensitive airways and reduces trauma. Soakable stylet and light source allow for safe and efficient sterilization (common cleaning procedures include Steris, Sterrad or Cidex (No Autoclave)). In cases where a video laryngoscope does not provide an unobstructed view of the vocal cords, the Clarus Levitan can help you see further. Replace your blind, rigid stylet with a Levitan, just in case your patient doesn’t have the anatomy of a mannequin.